AAA Polymer is proud to offer compostable can liners and compostable bags for businesses and residences throughout the New York area and beyond. If you're looking to save money, improve your image, and contribute to the conservation of our planet, compostable bag liners are an inexpensive solution to catapult your efforts. AAA Polymer offers two distinct and certified compostable can liners - Heritage BioTuf Compostable Can Liners. Continue reading to learn more about how compostable bags or compostable can liners can help your organization best meet its goals. What Are Heritage BioTuf Compostable Liners? Compostable liners and bags are used throughout New York city for the collection of organic waste, especially food items. 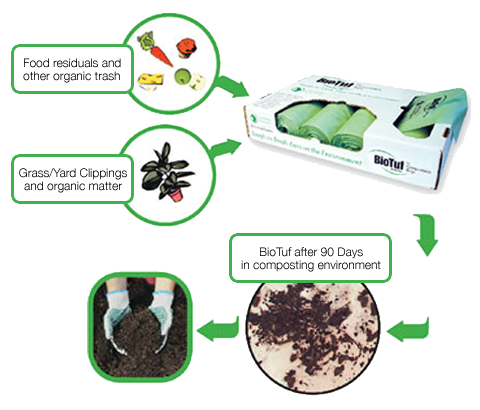 BioTuf compostable bags allow microbial organisms to eat them and safely reintegrate the nutrients back into the soil. These bags are 100% compostable and seamlessly function in line with New York's organic diversion / zero-waste programs, which is why they are approved for use in the NYC composting program. 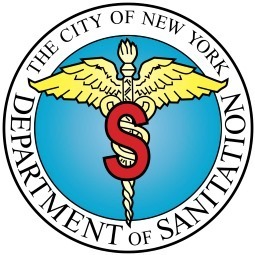 BioTuf bags are approved for use in the City of New York Department of Sanitation (DSNY) organics collection program. This program allows DSNY to collect different types of organic, biodegradable materials (e.g. food scraps, food-soiled paper, leaves and other yard waste) from residents in select areas. The Department of Sanitation then converts this organic waste into compost or renewable energy. DSNY promotes a healthy environment through efficient management of the City’s solid waste and environmentally sound long-range planning to handle New Yorkers recycling and garbage. DSNY is the world’s largest sanitation department, collecting more than 10,500 tons of residential and institutional garbage and 1,760 tons of recyclables every day. NYC businesses generate another 9,000 tons of material daily, which is collected by private carting companies. Conventional plastic bags are crafted from polyethylene, which is a derivative of petroleum, gas, and finite fossil fuels. These types of plastic bags end up in landfills and find their way into rivers and seas where they can linger on the earth for thousands of years. What Are the Benefits of Compostable Can Liners? A growing number of city and facility managers are choosing compostable can liners. One of the key benefits of utilizing government-approved BioTuf Compostable Can Liners is they enable materials, such as nut shells, coffee grinds, lettuce, leaves, yard clippings, and more to naturally compost, which reduces greenhouse gases. At AAA Polymer, we offer a variety of compostable bag sizes for virtually every application. Use our size chart below to find the perfect size for your unique needs. If you do not find the exact size you need, simply contact us today. Are you looking to make your company or municipality greener without disrupting the standard flow of business? AAA Polymer offers innovative and highly effective compostable bags and compostable can liners from the best manufacturers in the industry. Regardless of your needs or goals, our experts will guide you through the process and ensure you choose the best product for your unique needs. Submit this form to request a FREE can liner audit and consultation. No obligations. Are you ﻿wasting $1000s﻿ on the ﻿WRONG ﻿can liner?